Eaters – the self-titled brainchild of multi-instrumentalist and composer Bob Jones and recording engineer and sound designer Jonathan Schenke – is an adventure in juxtaposition. Sprawling synth swells are punctured by driving motorik grooves and screaming leads, relentless rhythmic sequences melt into viola drones and otherworldly oohs and ahhs, fractured pop is enveloped by washes of white noise and spat back out again, as lyrics about love and life are processed to the edges of humanity. Such mercurial output is refreshingly unexpected from two Brooklyn dudes with such substantial indie-rock pedigrees. After all, Jones – a founding member of Eternal Tapestry who has played on records released by K Records, Mississippi Records, Hardly Art, and Not Not Fun – and Schenke – who has helmed records with Parquet Courts, Forest Fire, and Dirty Beaches and mixed both corporate commercials and film festival favorites – became close while on tour with Frankie Rose. 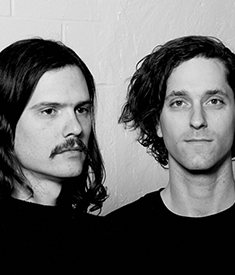 But while making a living in the world of established indie rock, the duo’s mutual love for early IDM, microtonal music and tape experimentation compelled them to eschew traditions and form a no-expectations process-oriented project that had less to do with being in a band and more to do with being whatever. Casually sophisticated and deliberately humorous, the push and pull of Eaters’ dynamic spread is surprisingly satiating.